Meet our Featured Caravan Pilot Jason, a Captain with SeaPort Airlines. An airline that is headquartered in Portland Oregon and operates out of its bases in Memphis, TN and San Diego, CA. They also operate out of Juneau Alaska as Wings of Alaska. They fly 16 different Grand Caravans (including the new EX model) to 22 different destinations in 10 states and Mexico and use the cool Callsign "Sasquatch". I met Jason online in our Caravan group on Facebook. He started out flying skydivers as I did. I can tell from our conversations that he is a super friendly guy and very passionate about aviation. I have not flown a lot of airplanes, but the Caravan is by far the most versatile of them all. When given a clearance to "maintain max forward speed" on final approach, I can give them 155 KIAS all the way to short final and still set it on the thousand foot marks. I'm also able to fly nine passengers, luggage and enough fuel to fly from destination to destination. The Caravan is a workhorse and I absolutely love flying it! I've wanted to be an airline pilot since I was about eight years old. No one in my family is a pilot, so I figured that I would be the first. I've actually just accepted a job at a regional airline flying regional jets. Hang out at the airports and meet people! The more people you can connect with the better you will be. I've only been flying for a little less than three years and when I started my connections were very few... I actually only knew one pilot. The more people that I met the better things got. That's how I landed my first paying gig, flying sky divers in a 182. I met some more people, and now I'm flying Part 135 in four different variations of Caravans. Meet people and ask questions. There's always a way to accomplish your goals and the more people involved, the better! 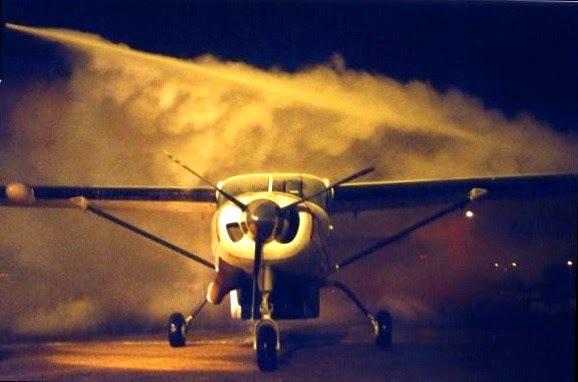 A Night Express Caravan being de-iced with heated propylene glycol. "I would enjoy this kind of weather from now until April" was a common expression during the last two winters. We had many mild spells, and few snow storms. Expressing a sentiment towards the sort of winter that meets your own personal preferences is probably a selfish thought, but since we have no control over the weather, its probably forgivable too. Us normal folks should respect the fact that some people spend their summers hoping for a cold and snowy winter. The last few weeks seem to show a trend for a cold winter in the northeast, and it suits me just fine. In fact, I'd enjoy this kind of weather until April. If the temperature is going to be cold, I'd prefer it to be very cold, because colder temperatures mean less trouble with icing. Icing, the accumulation of ice on the airplane during flight, is a bigger problem than thunderstorms are. Thunderstorms are not as frequent in summer as icing is in winter, and thunderstorms are loud and boisterous, not stealthy like icing is. It is never a mystery where thunderstorms are, but icing problems can exist in a wide range of winter clouds. Most winter flight planning must consider altitude and routing which minimizes exposure to icing conditions. Ice will form on the forward face of every part of the airplane's exterior almost any time that it flies through a cloud that is below 32 degrees. It collects on the leading edges of the wings and tail, on the propeller blades and around the engine air intake, and on the antennas, the landing gear, the windshield, and every little doo-dad that is protrudes from the plane. It cuts the efficiency of the wings, engine, and propeller while at the same time, adding weight and aerodynamic drag. It is 100% bad news because the aircraft requires more power when it is crusted with ice, but the ice reduces the power that the engine and propeller can deliver. The good news is that all clouds are not created equal, and the sky is seldom filled with clouds at all levels. Clouds with a strong moisture feed, such as the ocean, the great lakes, or a strong south wind ahead of a cold front that stretches to the Gulf of Mexico can be a problem. Weather arriving directly from the west such as we have had for the last few weeks is little threat because it is colder and dryer than storms which swing up from the southwest. Ice that remained on the wing of the Caravan after climbing through a layer of lake- effect clouds. The problem of aircraft icing lays in the fact that the water within a cloud does not automatically freeze when the temperature drops below 32 degrees. It needs a bit of a nudge. Clouds at a temperature of 30 degrees will typically be composed of tiny drops of water, which are not inclined to freeze unless something like an airplane bumps into them. At this temperature, the water in a particularly moist cloud will strike the airplane and stream backwards on the wings and tail before it finally freezes. Ice such as this will build quickly, and will overwhelm the airplane's de-icing devices. The atmosphere's ability to hold moisture decreases with temperature. As the temperature decreases, the cloud's moisture content drops, and the water droplets begin to freeze spontaneously. As more of the cloud's moisture freezes it becomes less of a threat. Any remaining water droplets freeze on contact with the plane and remain on the very leading edge of the wings and tail, where the accumulation can be managed with the deice systems. Somewhere between 15 and 5 degrees, the clouds become so dry, and the moisture so frozen that they can almost be ignored, just as though they were above 32 degrees. The Cessna Caravan that I fly has been called an "ice magnet" because it is simple, boxy, and utilitarian rather than sleek and fast. It has landing gear, wing struts, and a large external baggage pod which are exposed to the slipstream and provide so many "extra" places for ice to collect. Adding insult to injury, the airplane is under powered compared to the multi-engine planes that are more typical of commercial service. The plane had a full complement of deice devices however. There is a "hot plate" over part of the windshield which maintains a small area of ice- free viewing, there are heating pads at the roots of each propeller blade, and there are inflatable deice boots on the leading edges of the wings, tail, struts, and parts of the landing gear. The windshield and propeller anti- ice systems are electrical resistance heaters, but the rubber deice boots are pneumatic. Air is bled from the engine compressor section and sent to chambers within the boots, causing them to puff up rapidly, and break the ice that has stuck to them. Too cold for ice? Yes, there is such a thing. Once you are aware that clouds do not freeze until 10 degrees or so, and that cooler air can hold less moisture than warmer air, the concept is not hard to understand. It is closely related to the more familiar concept that it is "too cold for much snow to fall".